This documentation attempts to explain object inheritance and how it can be used in your object definitions. If you are confused about how recursion and inheritance work after reading this, take a look at the sample object config files provided in the Nagios distribution. If that still doesn't help, drop an email message with a detailed description of your problem to the nagios-users mailing list. The first variable is name. Its just a "template" name that can be referenced in other object definitions so they can inherit the objects properties/variables. Template names must be unique amongst objects of the same type, so you can't have two or more host definitions that have "hosttemplate" as their template name. The second variable is use. This is where you specify the name of the template object that you want to inherit properties/variables from. The name you specify for this variable must be defined as another object's template named (using the name variable). The third variable is register. This variable is used to indicate whether or not the object definition should be "registered" with Nagios. By default, all object definitions are registered. If you are using a partial object definition as a template, you would want to prevent it from being registered (an example of this is provided later). Values are as follows: 0 = do NOT register object definition, 1 = register object definition (this is the default). This variable is NOT inherited; every (partial) object definition used as a template must explicitly set the register directive to be 0. This prevents the need to override an inherited register directive with a value of 1 for every object that should be registered. 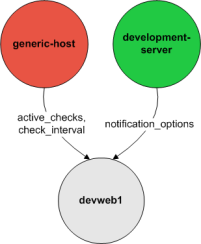 You can see that the check_command and notification_options variables were inherited from the template object (where host bighost1 was defined). However, the host_name and max_check_attempts variables were not inherited from the template object because they were defined locally. Remember, locally defined variables override variables that would normally be inherited from a template object. That should be a fairly easy concept to understand. Tip: If you would like local string variables to be appended to inherited string values, you can do so. Read more about how to accomplish this below. There is no inherent limit on how "deep" inheritance can go, but you'll probably want to limit yourself to at most a few levels in order to maintain sanity. Notice that the first host definition is incomplete because it is missing the required host_name variable. We don't need to supply a host name because we just want to use this definition as a generic host template. In order to prevent this definition from being registered with Nagios as a normal host, we set the register variable to 0. At the very least, using a template definition for default variables will save you a lot of typing. It'll also save you a lot of headaches later if you want to change the default values of variables for a large number of hosts. Nagios gives preference to local variables instead of values inherited from templates. In most cases local variable values override those that are defined in templates. In some cases it makes sense to allow Nagios to use the values of inherited and local variables together. Normally you have to either explicitly specify the value of a required variable in an object definition or inherit it from a template. There are a few exceptions to this rule, where Nagios will assume that you want to use a value that instead comes from a related object. For example, the values of some service variables will be copied from the host the service is associated with if you don't otherwise specify them. The following table lists the object variables that will be implicitly inherited from related objects if you don't explicitly specify their value in your object definition or inherit them from a template. Service and host escalation definitions can make use of a special rule that combines the features of implied and additive inheritance. If escalations 1) do not inherit the values of their contact_groups or contacts directives from another escalation template and 2) their contact_groups or contacts directives begin with a plus sign (+), then the values of their corresponding host or service definition's contact_groups or contacts directives will be used in the additive inheritance logic. Service templates can make use of a special rule which gives precedence to their check_command value. If the check_command is prefixed with an exclamation mark (! ), then the template's check_command is marked as important and will be used over the check_command defined for the service (this is styled after CSS syntax, which uses ! as an important attribute). Why is this useful? It is mainly useful when setting a different check_command for distributed systems. You may want to set a freshness threshold and a check_command that forces the service into a failed state, but this doesn't work with the normal templating system. Using this important flag allows the custom check_command to be written, but a general distributed template can be used to overrule the check_command when used on a central Nagios server. Thus far, all examples of inheritance have shown object definitions inheriting variables/values from just a single source. You are also able to inherit variables/values from multiple sources for more complex configurations, as shown below. When you use multiple inheritance sources, it is important to know how Nagios handles variables that are defined in multiple sources. In these cases Nagios will use the variable/value from the first source that is specified in the use directive. 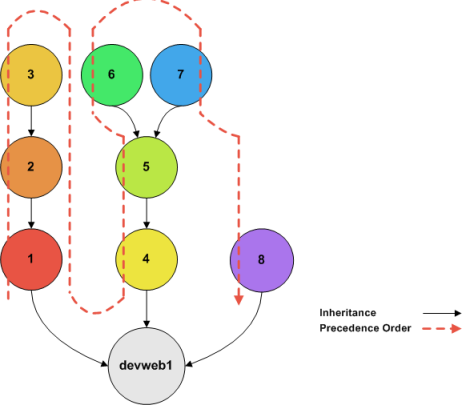 Since inheritance sources can themselves inherit variables/values from one or more other sources, it can get tricky to figure out what variable/value pairs take precedence. If some of those referenced templates themselves inherit variables/values from one or more other templates, the precendence rules are shown to the right.